Sardines are great for kids as they are packed with omega-3 essential fats. Some kids love them, but if yours don’t, this is an excellent way to serve them as the fishy taste isn’t too strong. 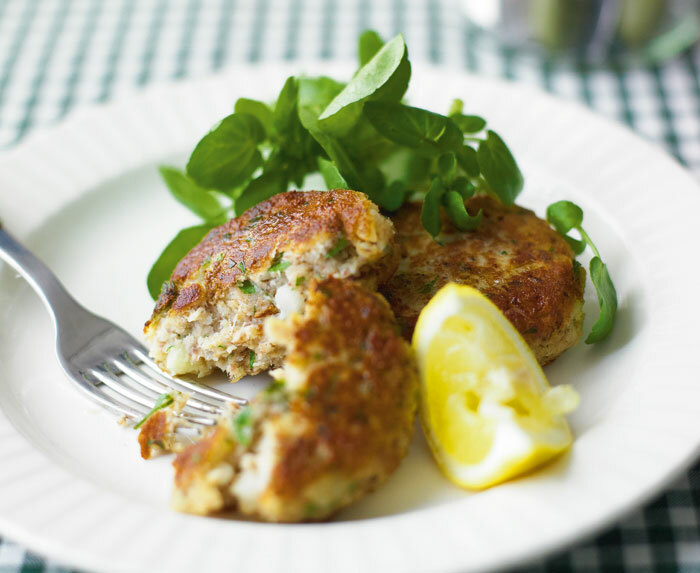 And as these fishcakes can be created from the inevitable can of sardines lurking at the back of the kitchen cupboard, along with other ingredients that you are likely to have at home, they are a life-saver recipe when it’s mid-week and you are overdue a trip to the supermarket. 1. Put the potatoes in a steamer and steam, covered, for 10 minutes or until soft. Transfer to a large bowl and mash coarsely. 2. In a bowl, beat the eggs together with a whisk. In another bowl, mash the sardines with a fork. Add the eggs, onion, mustard, parsley, lemon zest, cayenne pepper, salt and breadcrumbs and mix well. Add to the mashed potatoes and mix until well combined. Using your hands, divide the mixture into 10 equal pieces and shape each one into a fishcake. 3. Heat the oil in a large, heavy-based frying pan over a medium-low heat. Working in batches, carefully add the fishcakes to the pan and cook for 3 minutes on each side until browned and heated through. Repeat with the remaining fishcakes, adding more oil to the pan as needed. Serve warm with lemon wedges and salad. This is a typical brasserie dish found all over France and can be made with either sea bass or sea bream. 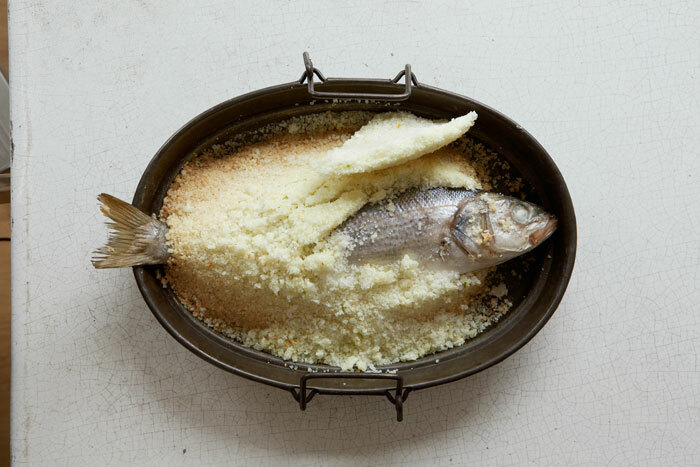 When baking in a sea salt crust, it is always better to cook the whole fish rather than fillets because it makes the flavour so much better. It is slightly less practical because you have to pick out the bones afterwards – but what you lose in convenience you gain in flavour. The combination of the fish with the chicory and citrus salad makes this a light, refreshing dish that zings! And don’t worry about the salt content – it’s just a casing to bring out the flavour. If you were to wander the coastal cities of France, you would stumble upon brasseries with some spectacular seafood. At the entrance you would probably see display tables of freshly caught fish and shellfish laid out on ice, and inside you might find a tank with live lobsters and crabs, ready to be chosen and cooked à la minute. 1. Preheat the oven to 190°C/375°F/gas 5. Put the egg whites in a large mixing bowl and whisk until stiff peaks form when the whisk is lifted from the bowl. 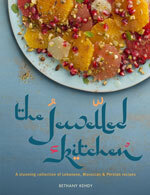 Add a squeeze of lime juice, the lime and orange zests and the salt and mix by hand, or with a spatula if you prefer. Line a baking tray with greaseproof paper and spoon one-quarter of the salt mixture over it in a layer. Place the sea bass on the salt, then cover it completely with the remaining salt mix, pressing the salt down firmly around the fish. 2. Bake the fish in the preheated oven for 15 minutes, then remove and leave to rest for 2 minutes without touching the salt crust. 3. Meanwhile, prepare the salad. Grate the orange zest and set aside, then peel the orange and cut the segments from between the membrane. Do this over a bowl to catch the juices, adding the segments to the bowl. 4. Cut off the base and outer leaves of the chicory, then cut each head in half, lengthways, and remove the core. Put in a separate bowl. Add the orange zest, dill and oil and mix until combined. Just before serving, add the reduced balsamic vinegar, 2 tablespoons of the reserved orange juice and half the orange segments. (Adding the acidic ingredients at the last minute is essential to keep the salad fresh and crunchy.) Season with pepper and whisk until well combined. 5. To serve, break the top of the salt crust by knocking it gently with a wooden spoon. Remove the skin from the fish (it may come off with the crust). Lift the top fillet of fish off the bone with a fork and put it on a warm serving plate (one fillet should be enough for 2 people). 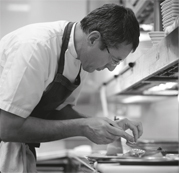 Remove the bone from the fish, revealing the second fillet underneath, and transfer it to the serving plate. Drizzle with oil and season with salt and pepper. Serve immediately with the salad for a light, fresh and colourful dish. 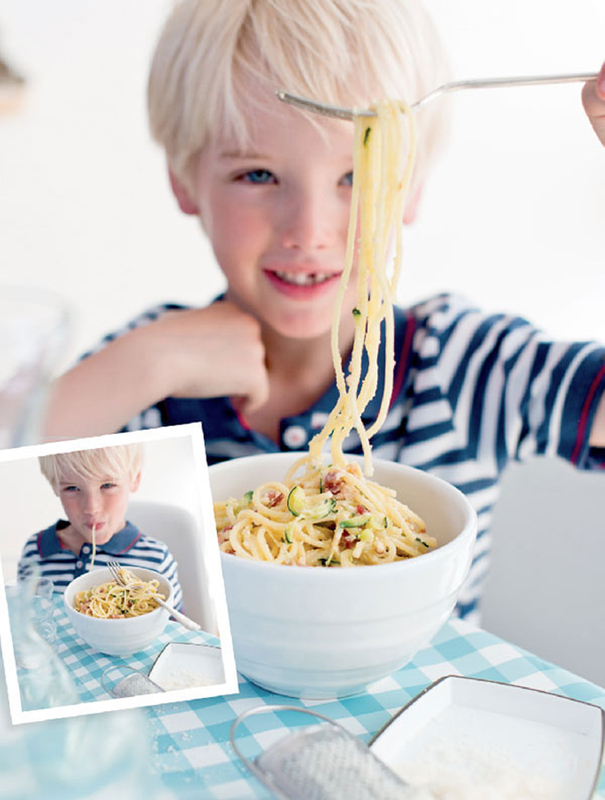 Courgette Carbonara – a summer holiday life-saver! 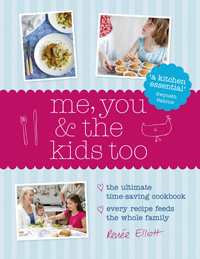 With the summer holidays nearly here, you need a quick, healthy family recipe to hand. Try Jo Pratt’s Courgette Carbonara – it’s much lighter than a traditional, rich carbonara which makes it a perfect summer meal. It also has one of your five-a-day! 1. Bring a large pan of lightly salted water to the boil, add the spaghetti and return to the boil. Leave to simmer for about 10 minutes until it’s just tender. 2. Meanwhile, heat the oil in a large frying pan over a medium heat, add the bacon and fry for 8-10 minutes until golden. Add the courgette and garlic and fry for a couple of minutes to take away the initial rawness. 3. In a bowl, mix together the eggs, mascarpone and Parmesan and season lightly with salt and pepper. 4. As soon as the spaghetti is cooked, remove it from the water with a pair of tongs and put it straight in the pan with the bacon and courgette and toss around. Finally, add the egg mixture. 5. Remove from the heat and toss together to coat the spaghetti in the sauce. The heat from the spaghetti will cook the egg just enough without it scrambling. Serve immediately. Any leftover spaghetti carbonara can be transformed into really tasty fritters that are perfect for lunch or even cold in school lunchboxes. Simply take the leftovers and snip the spaghetti a couple of times with a pair of scissors into smaller pieces. Mix with enough beaten egg to bind. You can also add some peas, sweetcorn or more grated courgette here too. Heat a drizzle of olive oil in a frying pan. Add spoonfuls of the spaghetti mixture and fry until golden on both sides. Drain on kitchen paper and serve hot or cold. https://nourishbooks.com/wp-content/uploads/2014/01/spaghetti-carbonara-preview.jpg 300 340 Victoria Lagodinsky https://nourishbooks.com/wp-content/uploads/2018/04/NourishLogo340x156-300x138-300x138.png Victoria Lagodinsky2014-07-25 00:00:292014-07-23 14:53:52Courgette Carbonara - a summer holiday life-saver! From Christine Bailey’s The Raw Food Diet. This is a creamy, rich mousse, perfect for satisfying chocolate cravings. Instead of sugar, it uses xylitol, a natural, low glycemic sweetener, which can help to keep your blood sugar levels stable. And as well as being delicious and low-carb, it’s also packed with super-healthy ingredients. 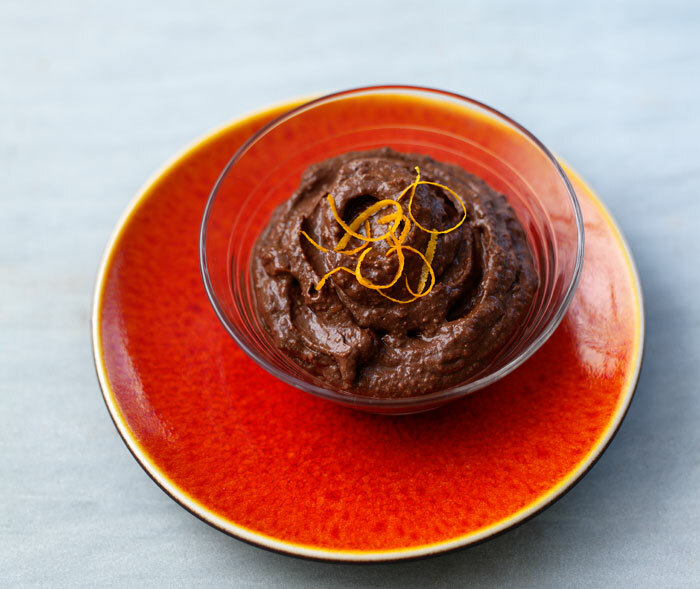 Raw cacao powder – derived from cold-pressed cacao beans – is packed with antioxidants (flavanols and polyphenols) and oranges, like other citrus fruits, are known for their immune-boosting properties. Add to this the healthy fats in the hazelnuts and avocados, and you can be sure that this indulgent-tasting dessert actually has some serious health credentials. 1. 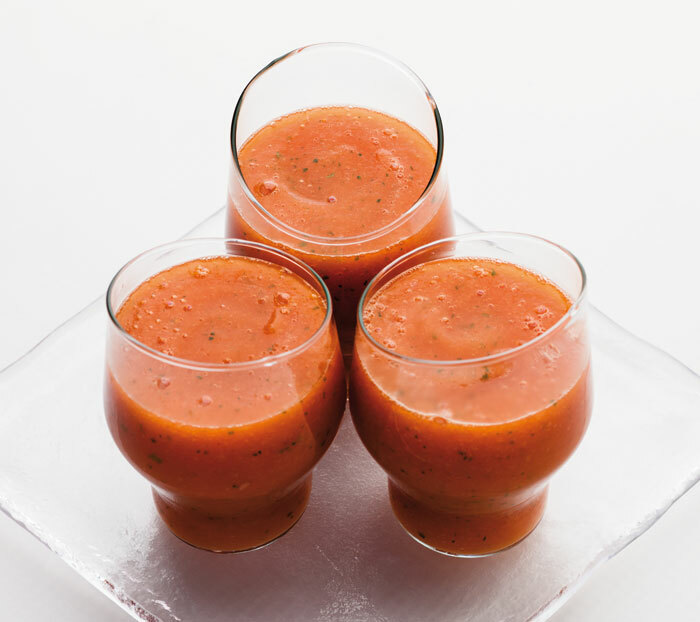 Place all the ingredients in a food processor with 125ml/4fl oz/½ cup water and process until very smooth. Add a little extra water to thin, if needed. 2. Chill for 30 minutes before serving. Top with a little orange zest. 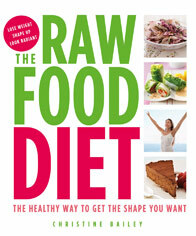 Looking for a raw food diet plan? Christine Bailey’s The Raw Food Diet shows you how to plan a weekend-long raw food blitz, and week long booster diet, and how to get the benefits of a raw food diet forever in her diet plan for life. 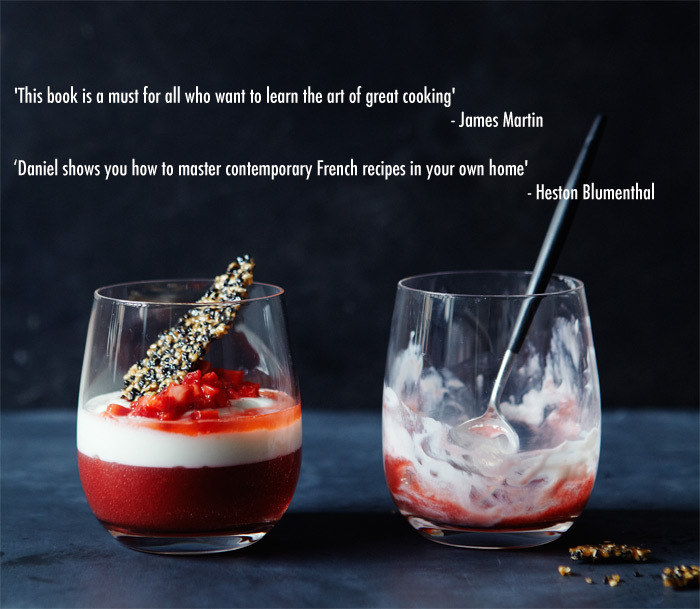 Just as importantly, The Raw Food Diet tells you what to eat, why and when, with a selection of delicious and satisfying recipes. Find out more and order the book with free UK postage. 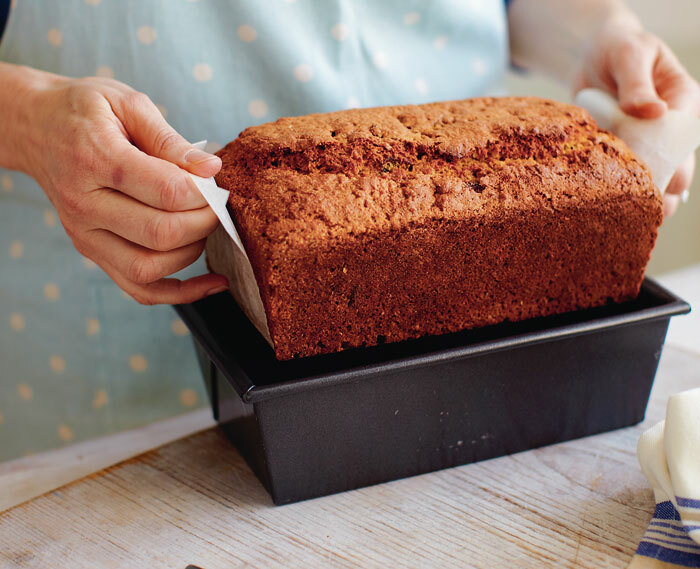 If you want something home-baked to fill the tins this weekend, try this delicious, moreish bread. Corn bread makes a tasty change from flour-based snacks and is good warm or cold, plain or toasted with butter. Apricots add a nice touch here, giving extra sweetness and goodness. 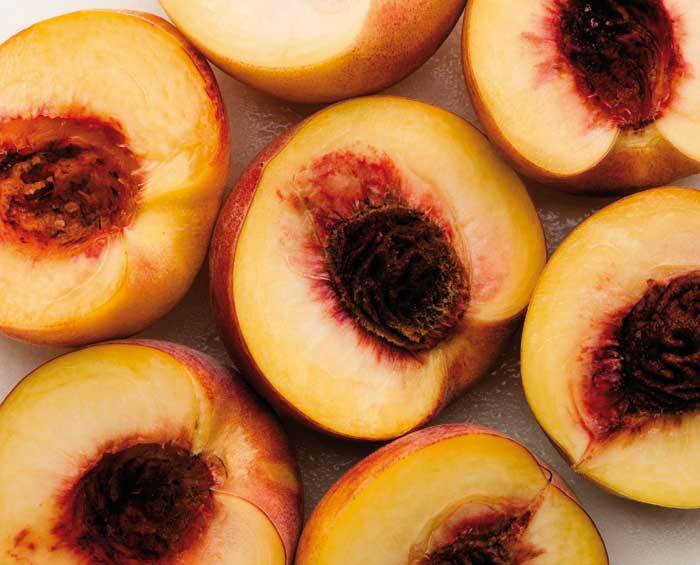 Make sure you buy organic apricots, which are unsulphured. 1. Preheat the oven to 170°C/325°F/gas 3. Grease a 23 x 13cm/9 x 5in loaf tin with butter and line with baking parchment. In a large mixing bowl, mix together the cornmeal, flours, sugar, bicarbonate of soda and salt. Heat the butter in a saucepan over a low heat until melted, then remove from the heat. In another bowl, lightly beat the eggs together with a whisk. Add the melted butter, yogurt, apricots and 240ml/8fl oz/scant 1 cup water and mix well. 2. Add the egg mixture to the flour mixture and beat slowly with a wooden spoon until just combined, but take care not to overmix. Pour the mixture into the loaf tin and level the surface, using a clean knife. Bake for 1 hour until lightly browned and a skewer inserted into the centre comes out clean. Remove from the oven and leave to cool for 15 minutes, then turn out of the tin, transfer to a wire rack, remove the baking parchment and leave to cool. Serve warm. From Nicola Graimes’s Easy Juicing. Relax, it’s the weekend! Kick back with this truly elegant drink, which was inspired by the classic Italian Bellini (a blend of white peach juice and Prosecco) created at the legendary Harry’s Bar in Venice. Definitely made for lazy afternoons and beautiful people – which includes you, naturally. 1. Juice the peaches and combine the liquid with the peach schnapps, then stir in the sugar. 2. Pour the fruit mixture into two Champagne flutes and top up with chilled bubbly or Cava. 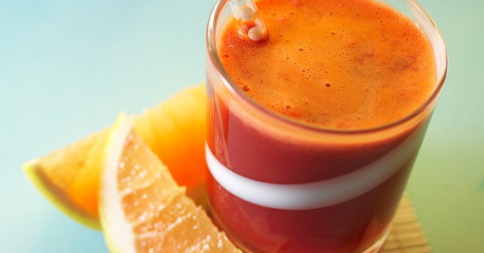 For more juicing recipes, download the Juices app. With over 400 juice and smoothie recipes specially designed by nutritionist Natalie Savona, the Juices app is the perfect partner in your quest to be healthier! 1. Thinly slice 1 kiwi fruit and set aside. 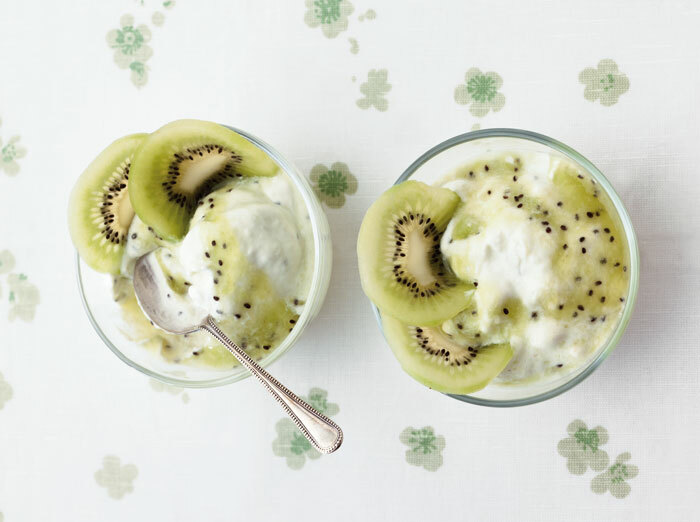 Chop the remaining kiwi fruit into chunks, put them in a blender and blend for 1–2 minutes until puréed. Add the honey and blend until just mixed. 2. Put the cream in a large bowl and whip, using an electric mixer, until stiff peaks form. Fold in the kiwi fruit purée, then spoon the mixture into four small glasses or bowls. Top with the reserved kiwi fruit slices and serve with crisp biscuits, if desired. 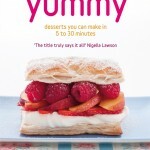 Perfect for the busy cook, this stunningly illustrated collection of dessert recipes gives you decadent treats you can enjoy on a daily basis. 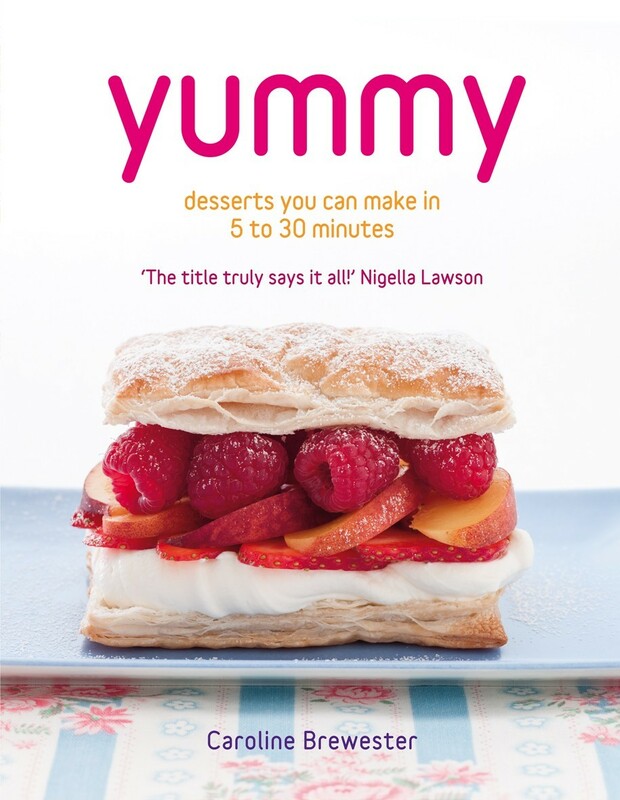 Whether it’s a quick indulgence to round off supper after a stressful day, something for the whole family after Sunday lunch or a stunning finish to a dinner party, enjoy the sweet smells and the tantalising tastes and textures of these delicious desserts. 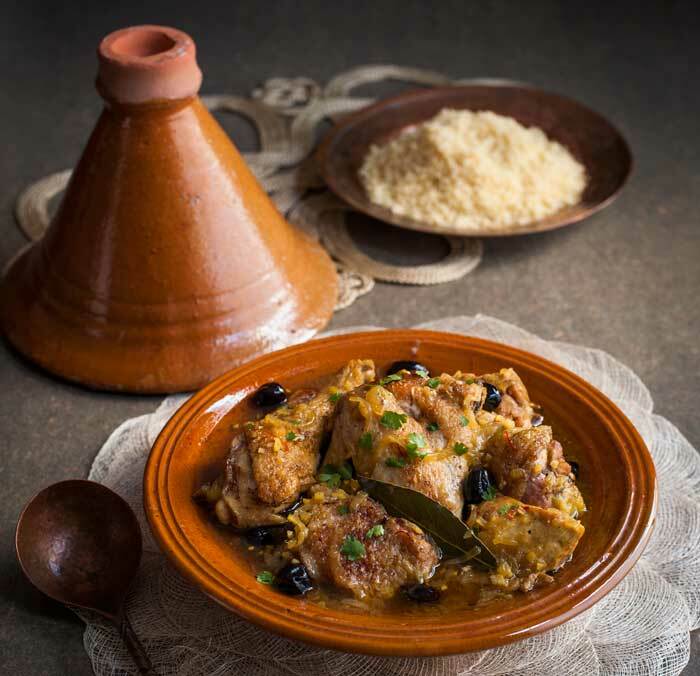 This simple one-pot tagine from Bethany Kehdy, the “new champion of Middle Eastern food” (Yotam Ottolenghi), dances with the flavours of the Maghreb. Fragrant with exotic spices and the tanginess of preserved lemon, you will feel as if you have been whisked away to sunnier climes. It’s perfect for summer entertaining, served with a fresh green salad and piles of buttery couscous. 1. Put the chicken breast-side down on a chopping board. Using a small and very sharp knife, cut through the skin between the thigh and the body. Twist the legs gently to remove them from the sockets. Turn the bird back over and ease the legs gently away from the body. Cut through the skin between the thigh and body as far around each leg as possible, keeping the knife as close to the body as you can. 2. Pull the leg away from the body more vigorously and bend it back on itself, so you expose the thigh joint and the ball breaks free of the socket. Cut between the ball and socket to release the leg, and cut through any flesh still attached to the carcass. The “oyster” should still be attached to the thigh. 3. Place a leg skin-side up, on a board and cut off the knuckle joint at the end of the drumstick. Feel and bend the joint joining the thigh to the drumstick to locate the gap in the bone. Cut through to split the leg into two. Repeat with the other drumstick and thigh. 4. Next, take a breast and wing off the carcass in one piece. To do this, make a cut through the skin and flesh running along either side of the cartilaginous ridge of the breastbone. Cut the breast meat back, from the cavity end of the chicken down towards and under the wing joint, keeping the knife as close to the carcass as possible. Finish by cutting through the joint where the wing is attached, giving you a breast with its wing attached. Repeat with the other breast and wing. 5. Lay each of the breast-wing pieces skin-side up on the board and cut slightly on the diagonal into two, leaving about one-third of the breast meat attached to the wing. Season with cinnamon and salt. 6. Heat the oil in a heavy-based pan over a medium-high heat and brown the chicken pieces, skin-side down. Remove from the pan and drain on kitchen paper. Add the onion to the pan, cover and sweat for 2–3 minutes until translucent, then add the garlic and ginger and cook for a further 1 minute until the fragrance is released. 7. Stir the saffron into the hot stock and return the chicken to the pan. Pour the stock over the chicken and add the bay leaf, then cover and reduce the heat. Simmer for 30 minutes or until the meat is tender. Add the preserved lemon and olives to the pan and cook for another 10 minutes. Stir in the coriander and serve with Couscous and lemon wedges, if you like. £20.00 l Buy the e-book now! 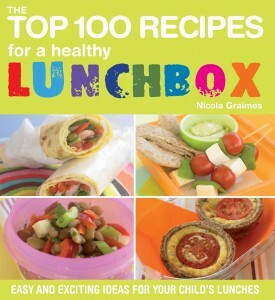 From Nicola Graimes’ The Top 100 Recipes for a Healthy Lunchbox. Made from wheat berries, bulgar wheat is a light, nutty grain that is a great source of dietary fibre and B vitamins as well as the immunity-boosting minerals iron and selenium. It’s a grain that is easy for children to eat, as well as adults – and this recipe works well for everyone. 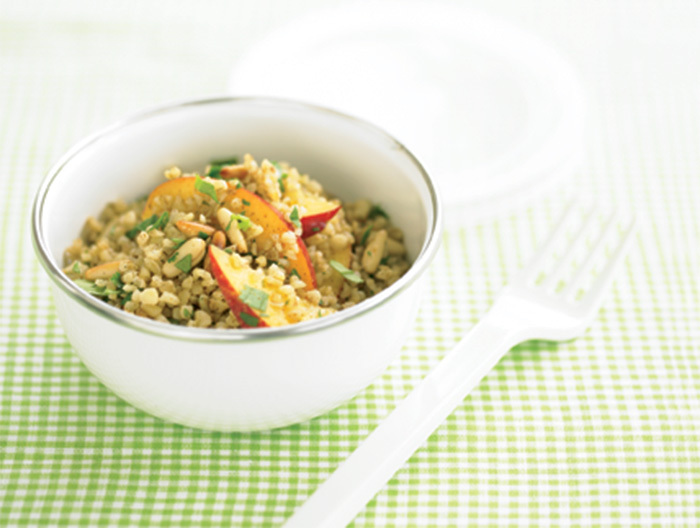 Bulgar wheat has a lovely mild flavour and in this recipes it blends well with this lightly spiced dressing. Add halloumi, mozzarella or chicken to introduce some protein to the meal. 1. Put the bulgar wheat in a saucepan with the stock. Bring to the boil then reduce the heat, cover and simmer for 10–15 minutes until the stock is absorbed. Remove from the heat and leave the pan to stand for 5 minutes with the lid on. 2. Meanwhile, heat the oil in a frying pan and fry the garlic for 1 minute, then add the spices and cook for another minute. Remove from the heat, add the wheat and stir to coat it in the spices. Transfer to a bowl and leave to cool. 3. Stir in the nectarine, pinenuts and coriander, if using, and season with pepper. From bananas to passionfruit and pineapples to mangoes, tropical fruits transport us beyond the office, the kitchen or the playroom and into a world where the sand is beneath our feet and the ocean laps at the shore. It’s all about bringing a little bit of paradise to your day. Apart from all that, tropical fruits bring a good dose of vital nutrients with them, too. All tropical fruits are low in fat, low in protein and high in carbs. What else you get entirely depends upon your chosen tipple. 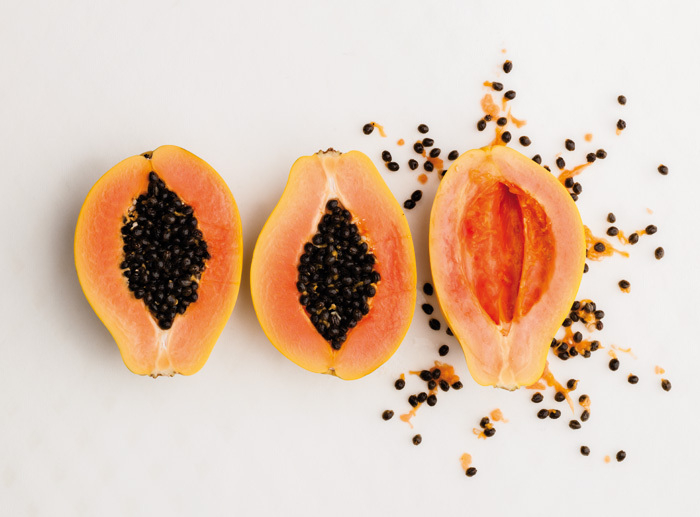 If you’re aiming for low-calorie but high vitamin C and folate, opt for something with a good squeeze of papaya. 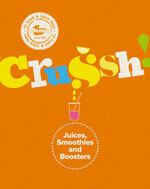 A juice made using pineapple will give you heaps of vitamin C, but also high levels of manganese and copper. If you’re after a happy pill, try something containing banana – its high levels of vitamin B6 help convert the amino acid tryptophan to serotonin, the ultimate feel-good hormone. What will all that do for me? Give you strength, focus, energy – high levels of potassium in bananas keep you calm, while practically citrus-levels of vitamin C in the other tropical fruits keep your circulation pumping. Make you super-elastic – high levels of copper in pineapples and mangoes make tropical fruits a winning choice if you want to keep your joints supple (and copper fights off ageing, too). Provide heavyweight security – many tropical fruits (including mangoes, papayas and guavas) burst with carotenoids. These are like heavyweight security that protects against attacks on your health. Be a Bali baby with this tropical juice cocktail – a real digestive soother. With mint and pineapple, this is a marriage made in heaven. You don’t juice the papaya seeds but there’s no need to waste them. They are edible and have a peppery taste like wasabi. 1. Put the pineapple through an electric juicer. Pour the juice into a blender or food processor, add the papaya and mint leaves and blend until smooth and the leaves are finely chopped. (Alternatively, you can simply chop the mint leaves and add them to the juice.) Serve immediately. 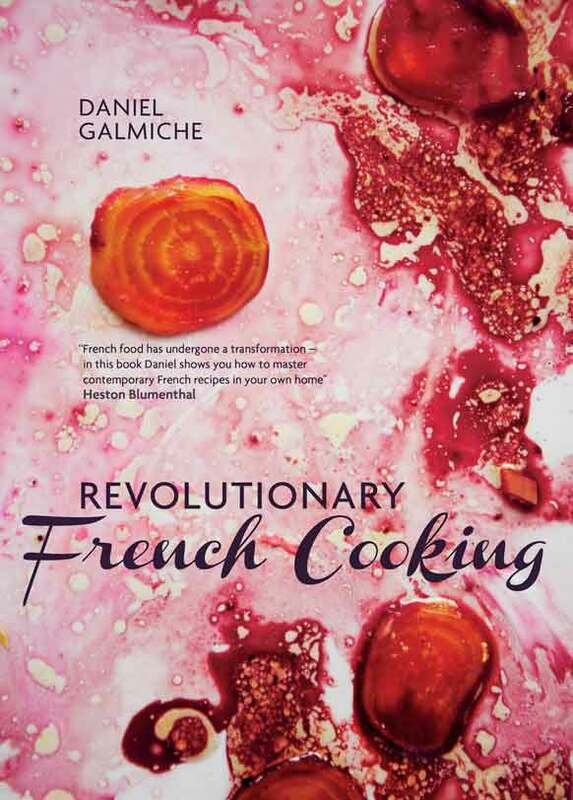 Pineapple, Chilli & Lemongrass Tarte Tatin – Revolutionary French Food! Revolutionise your Tarte Tatin! One of the sweetest fruits – and a particular favourite of mine – is the pineapple. This exotic fruit tastes wonderful cooked in a tarte tatin in place of the traditional apples and, of course, it needs less added sugar. The confident aroma and lusciousness of the pineapple pairs remarkably well with stronger spices and flavourings, and in this recipe I have contrasted it with fragrant lemongrass and a hint of chilli. You may be surprised by how successfully these two spices marry with the fruit – and with the buttery flavour of the pastry – to make a truly superb dessert. If you like, you can serve it with a scoop of coconut ice cream or sorbet. 1. Roll out the pastry on a lightly floured work surface, then cut out a circle slightly larger than a 20cm/8in tatin pan or flameproof baking dish. Roll the pastry over the rolling pin and transfer to a baking sheet, cover with cling film and chill in the fridge for 30 minutes to prevent the pastry shrinking during baking. to rest for 5–8 minutes to release the juice. 3. Stir the butter into the sugar in the pan. Sprinkle one-third of the chopped chilli over the pan. Put the pineapple wedges tightly around the edge of the pan in a circle, then make smaller circles of tightly fitting pineapple within this circle until the base is covered and all the pineapple is used. Put the lemongrass on top of the pineapple, add the strips of chilli, if you like, and bake for 30 minutes. 4. Remove from the oven and sprinkle another one-third of the chilli over the pineapple. Put the pastry on top, pushing the edges into the pan. Return the pan to the oven and bake for a further 20 minutes, or until the pastry is golden brown and crisp. 5. Remove the tart from the oven and leave to cool for a few minutes. Put an upside-down plate, slightly larger than the pan, on top of the tart and, holding both the plate and pan, turn the pan over to transfer the tart to the plate. Sprinkle with the remaining chilli, if you like. Serve warm, removing the lemongrass and chilli strips before cutting into portions. 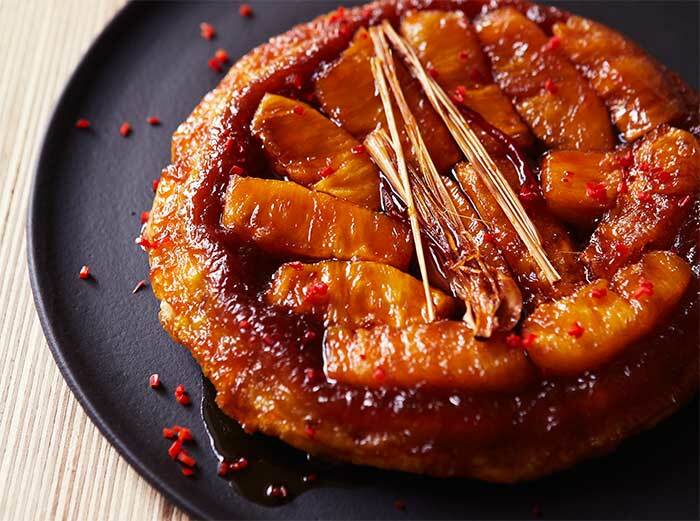 https://nourishbooks.com/wp-content/uploads/2014/07/Pineapple-Tarte-Tatin-preview.jpg 300 340 Victoria Lagodinsky https://nourishbooks.com/wp-content/uploads/2018/04/NourishLogo340x156-300x138-300x138.png Victoria Lagodinsky2014-07-14 12:09:112014-07-17 15:50:48Pineapple, Chilli & Lemongrass Tarte Tatin – Revolutionary French Food! If your garden is currently blossoming with lavender, try using it in this fresh, summery marmalade. Lavender’s strong flavour goes so well with sharp citrus fruits, making it the perfect pairing with lemons. It’s perfect for spreading on toast or hot muffins. One note of caution – make sure the plants have never been sprayed with insecticide before you decide to cook with them so you avoid any chemical nasties. You can also buy culinary lavender flowers from specialist lavender farms and online merchants. 1. Halve the lemons and squeeze out the juice and pips. Tie the pips, and any extra membrane that has come away during squeezing, in a piece of muslin. 2. Either by hand or using the shredding attachment of a food processor, thinly slice the lemon peel, with its pith, into shreds. 3. Put the lemon juice and peel, muslin bag and 1.75l/60fl oz/6&frac23; cups water in a preserving pan and slowly bring to the boil. Reduce the heat and simmer gently for 1½–2 hours until the peel is really soft and the liquid reduced by about half. 4. Remove the muslin bag from the pan and leave to cool for 5 minutes before squeezing it well and allowing the juices to run back into the pan. Discard the bag. 5. Add the lavender flowers and sugar to the pan and stir until the sugar has completely dissolved. Bring to the boil and boil rapidly for about 15 minutes or until setting point is reached. Test for a set either with a sugar thermometer (it should read 105°C/221°F) or put a teaspoon of the marmalade onto a cold saucer and leave to cool for a few minutes. If it wrinkles when you push it with your finger, then it is ready to use. 6. Meanwhile, sterilize enough jars in the oven so that they are ready to use. 7. Remove the pan from the heat and skim with a slotted spoon to remove any scum. Stir in the lavender essence. Leave to cool for 15 minutes (this will help to prevent the peel from rising in the jars). 8. Ladle the marmalade into the warmed, sterilized jars and cover immediately with a waxed disc and a dampened cellophane round or a lid. Label and store in a cool, dry, dark place. Refrigerate after opening.